ack – Better than grep? I’ve written previously about how to combine find and grep, and really, ack exists to obviate the use of find and grep. It ignores commonly ignored directories by default (e.g. all those .svn metadata folders that SVN insists on creating), and with a simple command line flag you can tell ack what sort of files you want searched. Furthermore, because it recurses by default, you don’t need to use the find command to traverse the tree. Furthermore, the matching results are highlighted right away, making it extremely apparent where the matches occur. I’m going to start using this at work and see if it can replace my grep/find hackery. Will let you know. Very impressed so far. and the filename would be passed as a single unit to cat. An important thing to note is that shell variables are expanded within double quotes. This is crucial to understand. It also allows you to solve problems caused by having spaces in file names, especially when combined with the * globbing behavior of the shell. For instance, let’s say we wanted to iterate over all the text files in a directory and do something to them. # Surround the $i with quotes and our space problem is solved. (Yes I know iterating over and calling cat on each argument is silly, as cat can accept a list of files (e.g. *.txt). But it illustrates the point that commands will be confused by spaces in the name and should use double quotes to handle the problem). Double quotes are my default while I’m working in the terminal. This can save you some backslash escaping your normally would have to do. You want to capture the results of another command, usually for purposes of assigning a variable. Hopefully this brief tour through the different types of quotes in bash has been useful. 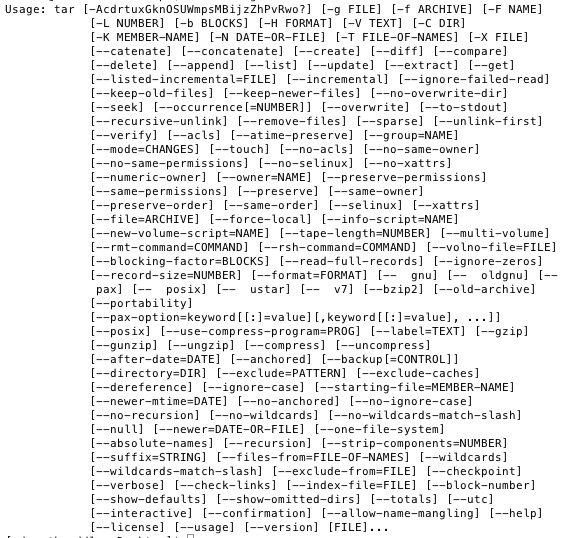 Maybe this is why people are afraid of the command line? args4j is a great tool for parsing command line arguments in Java. It makes the command line parsing very easy by using annotations. You can generate the usage screen very easily. You can generate HTML/XML that lists all options for your documentation. Create a class holding all the options you wish to parse. If no parse exceptions are thrown, your options object has all of the required options fields filled in, which can then be queried via normal getters. The sample main class provided by the args4j folks is especially useful; in this example they do not create a separate class to hold the options, but that is certainly an option. I’m really not sure how this stacks up to other command line parsing tools for Java; suffice to say it’s small, fast, the annotations make it a breeze to specify a set of names for different named arguments… it just works. Please use this instead of trying to roll your own options parsing code. This certainly works, but it takes four commands. Like most unix commands, the mkdir command can take multiple arguments, separated by spaces. So the three separate commands to create Java, Python, and Scala can be put onto one line. Note the ; separator between the two commands. We need to create the Programming folder before we can create the subfolders. This is better but still too verbose. It would be nice to remove the mkdir Programming call; we’d like to be able to create an arbitrarily nested folder and have mkdir create all the parent folders automatically. Fortunately there is a way to do this: the -p flag of mkdir does exactly this. This is better but still not perfect; we’re repeating ourselves 3 times with the Programming call. Enter an absurdly useful Bash shell construct known as brace expansion. I have shown you how to create all the parent directories using the mkdir command, and introduced you to the brace expansion macro of Bash. The latter is extremely powerful, and can be used to great effect within scripts. Note: The arguments within the braces must have NO space between after or before the commas in order for the brace expansion to work.